With Thanksgiving nearly upon us, we are starting to brainstorm what we can do for others as a family, this holiday season. These simple slipper care packages were our family project last weekend. We assembled several of these DIY Slipper Care Packages, to gift to the residents of a local nursing home this Christmas. We stuffed each pair of slippers with personal care items, magazines, and small treats. This is such a simple way to send warm & cozy holiday wishes to the elderly residents in our community, to show them that value and appreciate them. Hi friends, how have you been? A few years back, I started to pare down on what we gift to our children for the holiday. Excess seemed to be the word of the day on Christmas morning, and it wasn't a tradition that I wanted to continue to cultivate. Instead, we started a new tradition. We give each of our children 3 gifts on Christmas. They each get a special item (this is generally something that they wouldn't ask for during the year) a new pair of pajamas and something to read. Then we take the rest of our holiday budget, and we use it to give back to others during the holiday season. We stuff shoe boxes with special items and treats, for children in other parts of the World, that have never received a single gift on Christmas morning. We collect toys for our annual donation to a local children's hospital, and we donate our time at our local food pantry. This year, we've added these DIY Slipper Care Packages for the residents of our local nursing home, to our list. And we're still brainstorming more ways that we can give back as a family, before the year ends. These experiences have given our entire family a broader view of how incredibly fortunate we really are. It's also brought us much closer together. While we may not live a daily life of excess, we certainly have what we need and beyond, and we have each other. That in itself, is a gift. When we do have excess now, we seek ways to use it for others who may not have even the mere basics. It's a far better use of our resources; especially during the holiday season. I love that my children are learning to find joy in serving others, and that they're learning to walk through each moment with a grateful heart. After all friends, "The one who blesses others, is abundantly blessed." Ready to give back this holiday season? Read on for my simple tutorial on how to assemble these DIY Slipper Care Packages. As someone who loves to give back, I absolutely adore brands that do the same. When purchasing self-care items to stuff our DIY Slipper Care packages with, I found b+b® to be the very best choice. Why? b+b is a family-owned health and wellness company, that has made it their mission to "be better by giving." Through their national partnership with Americares, they donate ONE product to those in need for every ONE product purchased. This made our simple act of giving this holiday season, stretch 2x farther than I had originally planned -which is always a good thing! For every 24 and 50 count Extra Strength Acetaminophen packages that we purchased to stuff our slipper care packages with, one will be donated by b+b to individuals affected by homelessness, extreme poverty and natural disasters. 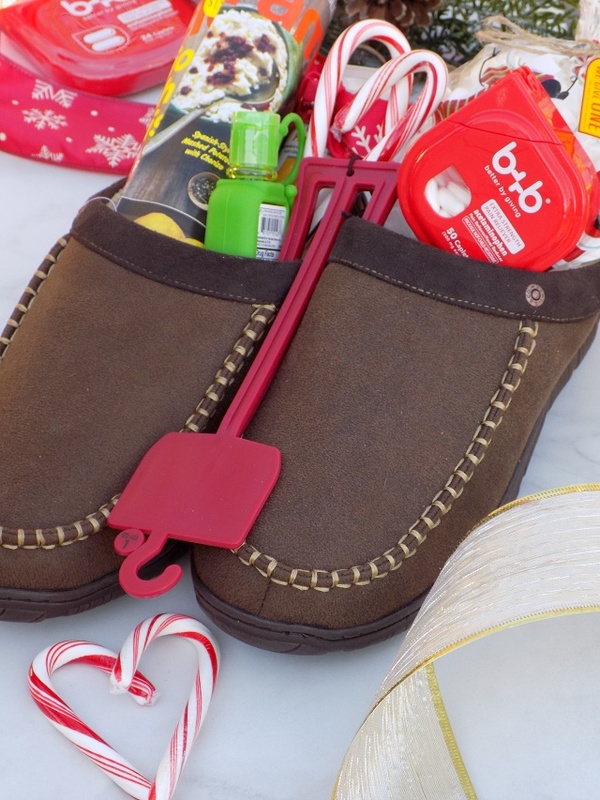 Ready to assemble some DIY Slipper Care Packages, this holiday season? Let me show you how simple (and affordable!) it can be, to be "better by giving" this holiday season. Hot chocolate, small candies / candy canes etc. Roll magazines / a small book and stuff inside one slipper. 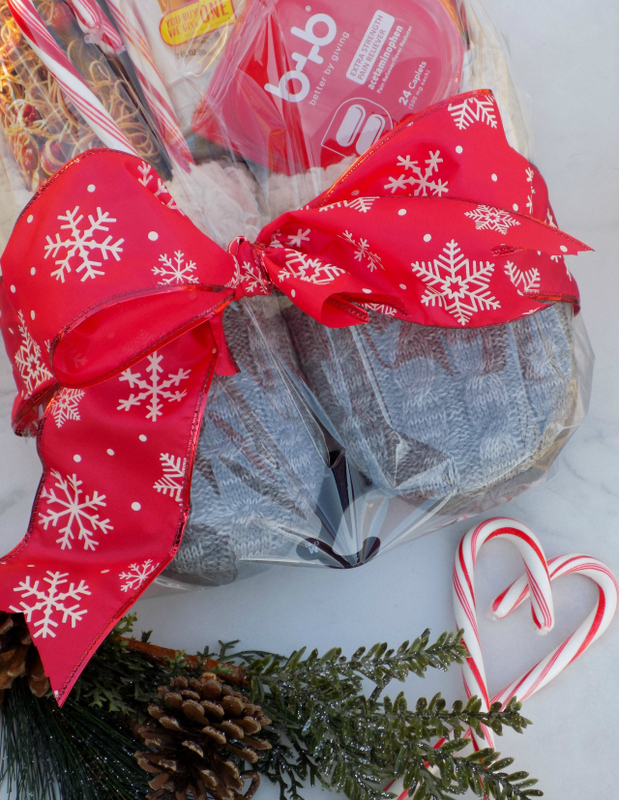 Add hot chocolate packages, a small bag of marshmallows, small candy treats/candy treats to this side of your slipper care package. Inside the remaining slipper add small personal Care items including hand lotion, hand sanitizer, lip balm, and b+b 24 and 50 count Extra Strength Acetaminophen packages. 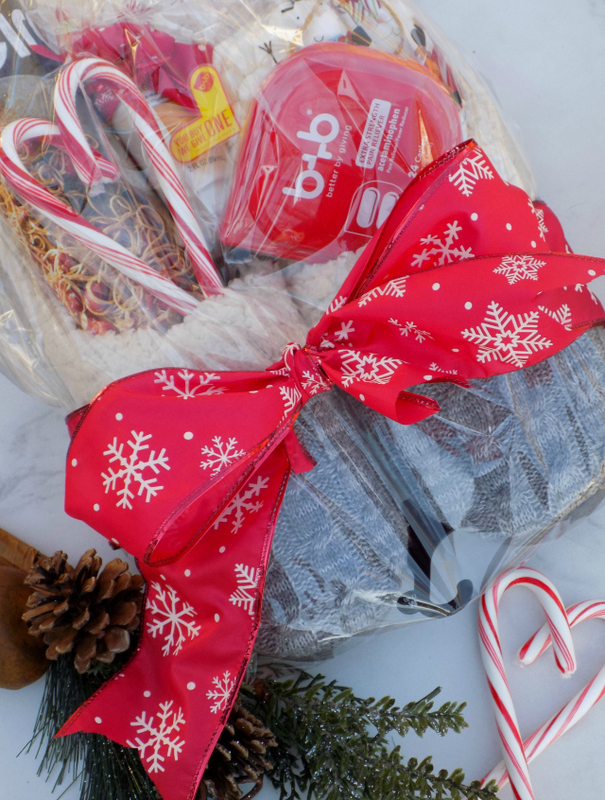 Wrap your completed stuffed DIY Slipper care packages with clear cellophane wrap, tie off / complete with festive holiday ribbon. 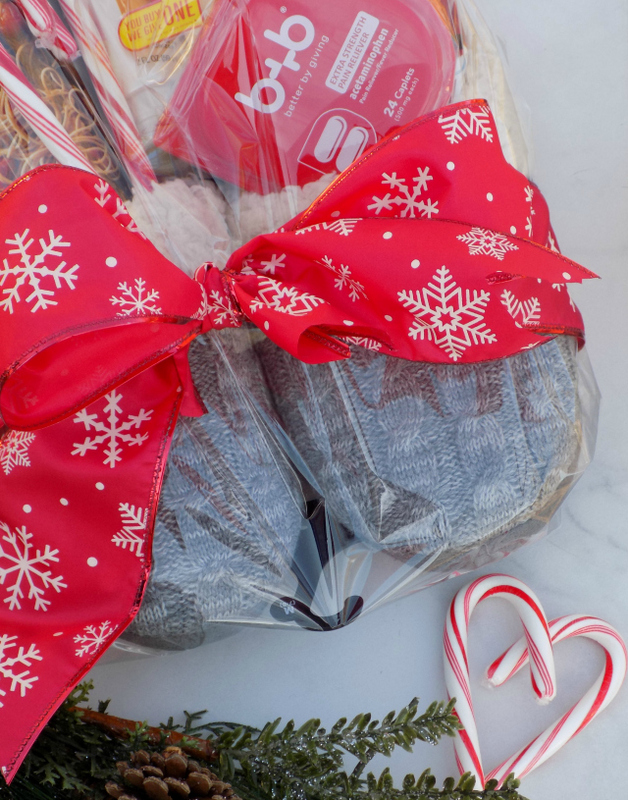 Gift your completed Slipper Care packages to someone special this holiday season! 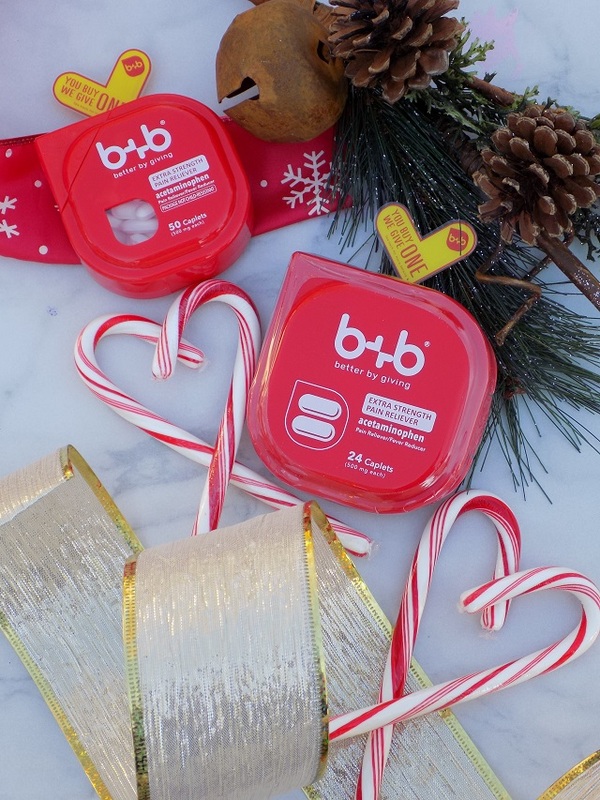 In addition to this companies upstanding handprint on local communities nationwide, b+b has taken caring for their consumers health & wellness one step further, with their product line. Each b+b product contains no gluten ingredients, no aspirin, and no caffeine, and they're packed in child-resistant on-the-go packaging, that also includes rounded edges to prevent cuts. This is literally the most consumer conscious thoughtful brand, that I've encountered in a long time. Sending a big virtual bear hug out to these folks for a job extremely well done; you've earned my business for life! Ready to be "be better by giving" this holiday season? 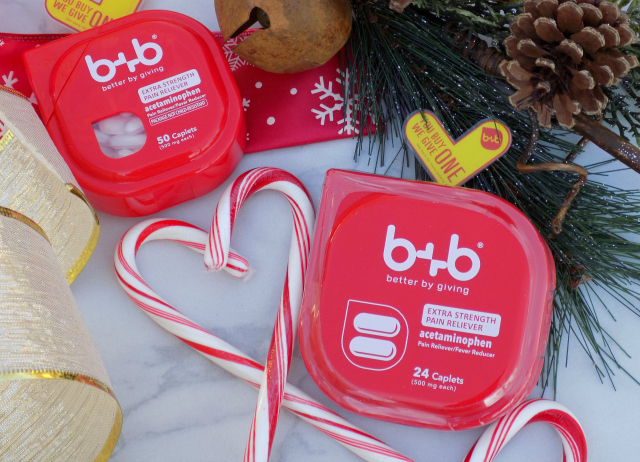 Stock your medicine cabinet for your impending holiday guests, and all of your holiday care packages with b+b products! 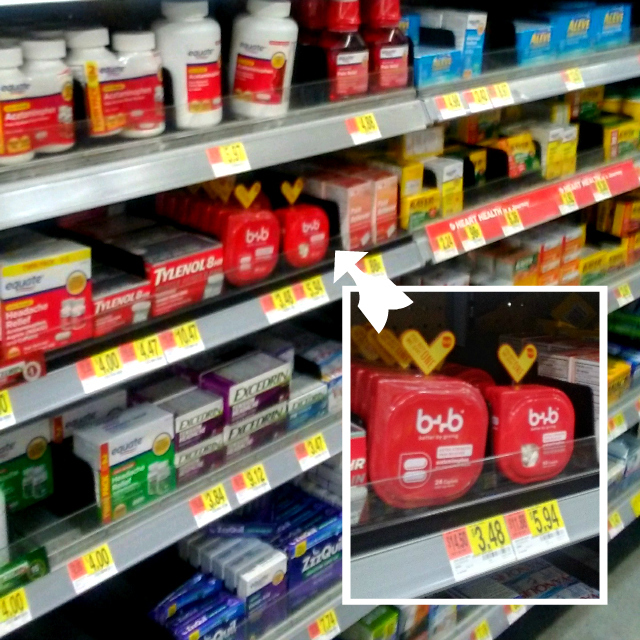 b+b's product line is available now at Walmart. CLICK HERE to find a store in your area. Make sure to grab the Ibotta offers on b+b products (acetaminophen, ibuprofen and naproxen) HERE , too! Extra savings means extra money to do more for those in need! Make every penny count this holiday season, friends. How do you plan to give back to those in need this holiday season? I'd love it if you'd share in a comment below, or tag me on Twitter @one_savvymom . Wishing everyone a magical holiday season! * Disclosure: Product(s) should be used as directed. This product is not intended to diagnose, treat, cure or prevent any disease. OMG! I would love one of these Slipper care packages for the Holidays. There are super cute slippers right now on sale at Target and I would love to give this as a gift to my sister! Thank you for such a great idea! Sure thing! :) Happy Holidays, Susan! I love this idea. Simple and easy to put together. I love this idea of a slipper care package! I will have to do this for several of our neighbors. This is the perfect gift idea!! All the women in my family ask for slippers every year. This is such a great way to add a personal touch! Looks so cute. I love this gift idea. Thanks! Cozy & simple :) Happy Holidays, Elena! This is a great idea to help others. I will see if my daughter's girl scout troop would like to do this. This would be perfect for anyone on your Christmas list or to donate to a local shelter! This would be perfect to send oversea to our troops, or add some thick socks and give to the homeless.It looks so cute. This is perfect to use for hostess gifts! This is an awesome idea for a holiday or winter care package. Oh this is such a wonderful idea! Would make a wonderful RAOK to some neighbors that are elderly or just had surgery!